Synthetic peptide within Human BRAF aa 50-150. The exact sequence is proprietary. WB: HeLa whole cell lysate (ab150035), PC-12 whole cell lysate, mouse brain tissue lysate IHC-P: human prostate cancer tissue, Human breast cancer tissue. This antibody also reacts with rat brain tissue. IP: HeLa cells. Our Abpromise guarantee covers the use of ab33899 in the following tested applications. WB 1/1000 - 1/5000. Detects a band of approximately 87 kDa (predicted molecular weight: 85 kDa). Involved in the transduction of mitogenic signals from the cell membrane to the nucleus. May play a role in the postsynaptic responses of hippocampal neuron. Note=Defects in BRAF are found in a wide range of cancers. Defects in BRAF may be a cause of colorectal cancer (CRC) [MIM:114500]. Defects in BRAF are involved in lung cancer (LNCR) [MIM:211980]. Defects in BRAF are involved in non-Hodgkin lymphoma (NHL) [MIM:605027]. NHL is a cancer that starts in cells of the lymph system, which is part of the body's immune system. NHLs can occur at any age and are often marked by enlarged lymph nodes, fever and weight loss. Defects in BRAF are a cause of cardiofaciocutaneous syndrome (CFC syndrome) [MIM:115150]; also known as cardio-facio-cutaneous syndrome. CFC syndrome is characterized by a distinctive facial appearance, heart defects and mental retardation. Heart defects include pulmonic stenosis, atrial septal defects and hypertrophic cardiomyopathy. Some affected individuals present with ectodermal abnormalities such as sparse, friable hair, hyperkeratotic skin lesions and a generalized ichthyosis-like condition. Typical facial features are similar to Noonan syndrome. They include high forehead with bitemporal constriction, hypoplastic supraorbital ridges, downslanting palpebral fissures, a depressed nasal bridge, and posteriorly angulated ears with prominent helices. The inheritance of CFC syndrome is autosomal dominant. Defects in BRAF are the cause of Noonan syndrome type 7 (NS7) [MIM:613706]. Noonan syndrome is a disorder characterized by facial dysmorphic features such as hypertelorism, a downward eyeslant and low-set posteriorly rotated ears. Other features can include short stature, a short neck with webbing or redundancy of skin, cardiac anomalies, deafness, motor delay and variable intellectual deficits. Defects in BRAF are the cause of LEOPARD syndrome type 3 (LEOPARD3) [MIM:613707]. LEOPARD3 is a disorder characterized by lentigines, electrocardiographic conduction abnormalities, ocular hypertelorism, pulmonic stenosis, abnormalities of genitalia, retardation of growth, and sensorineural deafness. Note=A chromosomal aberration involving BRAF is found in pilocytic astrocytomas. A tandem duplication of 2 Mb at 7q34 leads to the expression of a KIAA1549-BRAF fusion protein with a constitutive kinase activity and inducing cell transformation. Belongs to the protein kinase superfamily. TKL Ser/Thr protein kinase family. RAF subfamily. Contains 1 RBD (Ras-binding) domain. Nucleus. Cytoplasm. Cell membrane. Colocalizes with RGS14 and RAF1 in both the cytoplasm and membranes. Lanes 1 - 3: Merged signal (red and green). Green - ab33899 (unpurified) observed at 90 kDa. Red - loading control, ab8245, observed at 37 kDa. ab33899 was shown to recognize B Raf in wild-type HAP1 cells as signal was lost at the expected MW in B Raf knockout cells. Additional cross-reactive bands were observed in the wild-type and knockout cells. Wild-type and B Raf knockout samples were subjected to SDS-PAGE. ab33899 and ab8245 (Mouse anti-GAPDH loading control) were incubated overnight at 4°C at 1/1000 dilution and 1/20000 dilution respectively. Blots were developed with Goat anti-Rabbit IgG H&L (IRDye® 800CW) preabsorbed ab216773 and Goat anti-Mouse IgG H&L (IRDye® 680RD) preabsorbed ab216776 secondary antibodies at 1/20000 dilution for 1 hour at room temperature before imaging. Immunohistochemistry (Formalin/PFA-fixed paraffin-embedded sections) analysis of Human breast cancer tissue sections labeling BRAF with purified ab33899 at 1/100 dilution (4.77 µg/ml). Heat mediated antigen retrieval was performed using heat mediated antigen retrieval using ab93684 (Tris/EDTA buffer, pH 9.0). 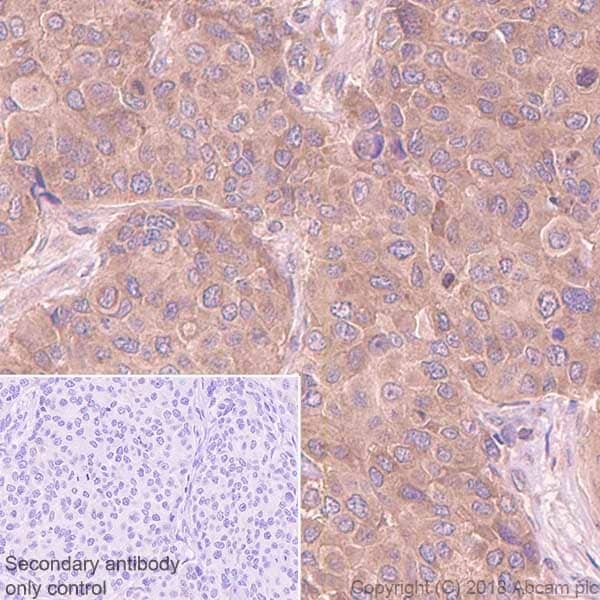 ImmunoHistoProbe one step HRP Polymer (ready to use) was used as the secondary antibody. Negative control: PBS instead of the primary antibody. Hematoxylin was used as a counterstain. Observed band size: 87 kDa why is the actual band size different from the predicted? ab33899 (Purified) at 1:500 dilution (0.954 µg/ml) immunoprecipitating BRAF in HeLa whole cell lysate. This image shows paraffin embedded human prostate cancer tissue sample stained with ab33899 (unpurified) at 1/250 dilution. ab33899 (unpurified) staining B Raf cells from human prostate tissue by immunohistochemistry (formalin/PFA-fixed paraffin-embedded sections). Cells were formaldehyde fixed and permeabilized in PBS-Tween 20 prior to blocking in 70% serum for 10 minutes at 25°C. The primary antibody was diluted 1/250 and incubated with the sample for 1 hour at 25°C. A biotin conjugated goat polyclonal to mouse Ig was used as the secondary. Publishing research using ab33899? Please let us know so that we can cite the reference in this datasheet. Customer kindly contacted us as these products were not working in IHC-P or ICC. Thank you for confirming these details and for your cooperation. The details provided enable us to closely monitor the quality of our products. I am sorry this product did not perform as stated on the datasheet and for the inconvenience this has caused. As requested, I have issued a free of charge replacement with the order number xxxxx. To check the status of the order please contact our Customer Service team and reference this number. Please note that this free of charge replacement vial is also covered by our Abpromise guarantee. Should you still be experiencing difficulties, or if you have any further questions, please do not hesitate to let us know. As we had spoken about, I have also created a discount code for use with . The code is: xxxx and is valid until: xxxx. I wish you the best of luck with your research. Thank you what is the status of our order? Unfortunately shipment of this order is being held up by our accounts team. Our accounting department can be contacted by email at mailto:us.credits@abcam.com or by telephone using the information at the Contact Us link in the top right corner of our website. Please refer to theorder reference numberin any correspondence with our accounting department. I hope this is helpful. Please contact me again with any technical questions you may have. Thank you for your enquiry. 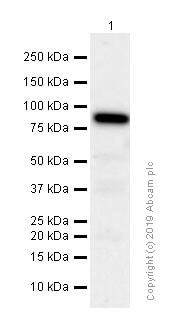 I have been in touch with the lab and I can tell you that this antibody has NOT been tested for its capacity to differentiate between wild type and variant (V600E) BRAF. I could not find literature relating to the variant sequence of BRAF. However, I can tell you that the immunogen sequence used to raise this antibody was CGEHNPPSIYLEAYEEYT, corresponding to N terminal amino acids 70-86. I hope this information helps, please do not hesitate to contact us if you need any more advice or information. ab33899 = B raf Ab [EP152Y] Reacts with Rat and Human. Does not react with Mouse. Not yet tested in other species. BLAST 'CGEHNPPSIYLEAYEEYT' Sequence is an exact match between human and mouse, so why would this Ab not react in mouse? Surrounding sequences of immunogen might not be homologous. Contact supplier - tested which applications in mouse, want protocols. Thank you for your enquiry and patience. Ab33899 (B-raf antibody) was tested by Western Blotting on various mouse tissues (brain, heart, kidney, muscle) and was found to not cross-react with these tissues. 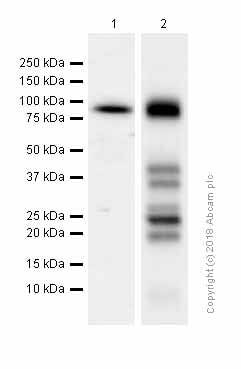 This antibody should work fine in your system, human transgene in a mouse model. Thank you for your email. I plan to order your Braf antibody through our US purchasing office. I would like to know where is the location of immunogen. I am looking for antibody targeting c-terminal portion of Braf protein corresponding to exon 17-18.